A few determined Canadians may have felt like something big was actually about to happen—before they spent more than five years in litigation with the Government of Canada. Maybe they were a bit too hopeful. The plaintiffs were basically claiming that the Bank of Canada is mandated under the Bank of Canada Act to provide interest-free loans for public projects undertaken by federal, provincial and municipal governments. But the Crown argued that the claim was frivolous. And, not surprisingly, the Supreme Court of Canada decided that it does not want to hear the case or the appeal. State-sanctioned monetary systems are instruments of control. Some individuals definitely benefit from this profitable scheme, but the rest of us might want to consider using alternative methods or media of exchange. The reigning monarch of Canada, as the living embodiment of the Crown and legal personification of the state, gives to the Parliament of Canada the legislative authority over coinage, currency, legal tender, banking and interest. The Canadian dollar is the official monetary unit within the territorial boundaries of this place called Canada. The dollar is the common medium of exchange and the ubiquitous unit of measurement. The Bank of Canada, the country’s central bank, opened in 1935 as a privately-owned institution and in 1938 it became a federal Crown corporation to regulate credit and currency in the best interests of the economic life of the nation. The shares of the Bank of Canada and the Royal Canadian Mint are held by the federal Minister of Finance on behalf of Her Majesty in right of Canada. The Bank of Canada claims a monopoly on the production and distribution of bank notes, which are not backed by gold. Canada went off the gold standard in 1914, and then went back on it in 1926, but officially suspended the redemption of notes for gold in 1933. Legal tender includes bank notes issued by the Bank of Canada as well as current coins issued by the Royal Canadian Mint that are intended for circulation in Canada. And it’s expensive to produce all these notes and coins, so it could actually save money for the country if it went cashless. The central bank describes a broad measurement of money that includes cash and other so-called deposits. Money, according to the Bank of Canada, has taken many forms and can be anything that is widely accepted as a means of exchange, a unit of measurement, and a store of value for future use. The central bank indicates that money is based on a social agreement to recognize value, and the value of money depends on the confidence of those who use it, and it has value because it is widely accepted. But the Bank declares that cryptocurrencies fall short of its own broad definition of money. Canadian money in the present system is credit that is generated by making digital accounting entries, but it is systemically scarce because it is created as interest-bearing debt. Total aggregate debt, including principal and interest, is always more than the entire amount of money in existence at any one time. The monetary system is designed to siphon and concentrate wealth, which drives unsustainable economic growth, contributes to involuntary unemployment, increases unnecessary competition instead cooperation, and keeps most of us in a collective state of perpetual debt—but the general assumption appears to be that all of this debt can eventually be paid off if we just cut expenses and work harder (and it doesn’t even seem to matter if the work is unenjoyable, unproductive or even downright destructive—as long as we’re paid to do it). Government obtains credit (money that has been created as interest-bearing debt) so that it may spend even more than it collects in taxes—and then passes its debt to taxpayers. Taxes are paid in Canadian dollars, and there is a very real threat of fines, incarceration or loss of property for not paying taxes, so most people probably feel compelled to use state-sanctioned money. Between 1974 and 2011 Canadian taxpayers supposedly paid over one trillion dollars in compounded interest on the federal debt. In 2016/17 all levels of government (federal, provincial and municipal) in Canada collectively spent $61.2 billion on interest payments. The chartered banks and other financial institutions in Canada also create money by providing credit and so-called loans for the public. Financial institutions get to lend our own credit back to us and charge interest for it. Most of the money in Canada is created by the six largest banks in the country—in collusion with the state and its government, central bank and mint. Legal tender notes and coins, which are merely tangible tokens of credit, are distributed to the financial institutions to satisfy public demand for cash. Between 1992 and 1994, the federal government phased out statutory non-interest-bearing reserve requirements for chartered banks in Canada. The Office of the Superintendent of Financial Institutions was created in 1987 to supervise federally regulated deposit-taking institutions and implement capital adequacy requirements, which are developed at a global level by the Bank for International Settlements in Switzerland. 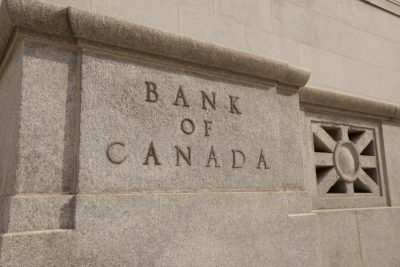 The Bank of Canada indirectly manages the rate of money growth by influencing short-term interest rates and manipulating the price of credit, which influences decisions to borrow and spend and affects demand for goods and services. New money is often put into circulation without necessarily bringing more goods and services to the market, which can lead to monetary inflation and price inflation. Inflation is like a hidden tax. But the Bank of Canada would have us believe that Canadian money is a reliable store of value—even though there has clearly been a substantial decrease in the domestic purchasing power of the dollar and a steady erosion of the value of savings since the central bank was established. The majority of people in Canada presumably believe that the Bank of Canada is our central bank and state-sanctioned money is our money. But the Bank of Canada is not serving our best interests, so why would we want to revive it? The Canadian dollar is not a benign medium of exchange or a reliable store of value, so why do we keep using it? It’s probably a safe bet that the vast majority of people haven’t considered using anything besides state-sanctioned national currencies and aren’t even aware of any alternatives. There may be growing concern regarding the monetary system, but clearly there are different opinions. There definitely isn’t agreement on the form, function, creation, supply, value or even necessity of money. This certainly adds to the confusion and it’s doubtful that we’ll actually reach a consensus on the nature of the problem or the solution, but there doesn’t necessarily need to be uniformity of opinion. Barter will always be one way to directly swap goods and services, but it isn’t convenient on a large scale. Scarce commodities can still be used as a tangible medium of exchange, if you happen to have some gold or silver. Some people want an official medium of exchange and a central bank, with third-party regulation and control of the creation, allocation and pricing of currency and credit. But many people are now comfortable using decentralized digital currencies. Other individuals may want to create and issue their own credit instruments as a promise that they are willing and able to settle debts by providing their goods or services. New money can be created when new goods and services are brought to the market, which could avoid the problems of inflation. Only the issuer should be obliged to accept and redeem their IOU—at face value (and possibly upon demand). Some people might choose to form mutual credit clearing associations to mediate transactions and facilitate the reciprocal exchange of value. Basically all this requires is an ongoing record of account balances—sales and purchases, credits and debits. Goods and services pay for other goods and services. This would allow people to temporarily purchase more than they have sold—if they are willing and able to bring an equal value of their own labour, services, goods and assets into the market. An essential feature of this system is that members can provide sufficient interest-free credit to each other—for a specified time with certain conditions. Surplus and saved credits (from sales) can be invested and/or loaned out, especially for larger projects. Mutually agreeable terms, fees and rates can be negotiated for loans and credit. Numerous commodities and other assets can be used to store value and as units of account to measure value, and diverse items can be used as intermediary instruments in trade. Different forms of money can circulate in the market if people are willing to use them, and diverse payment systems and trading arrangements can operate concurrently to transfer value and ownership. We don’t need to bother trying to revive or abolish the Bank of Canada, and we don’t need to nationalize the financial institutions, but we also do not need to rely on central banks or chartered banks to control and allocate credit and currency. If we are dissatisfied with the monetary system than we might want to stop using state-sanctioned money and begin to experiment with various methods and media of exchange, without pushing our preferences on anyone else or trying to force other people to participate in our trading arrangements; and perhaps we can then begin to withdraw from a monetary system that seems to be designed to confiscate wealth by trapping most of us in a collective state of perpetual debt. James Clayton is a writer and community currency advocate. He lives in Ontario, Canada. Thomas H. Greco, Jr., The End of Money and the Future of Civilization (Vermont: Chelsea Green Publishing, 2009), 63. Thomas H. Greco, Jr., Money. Understanding and Creating Alternatives to Legal Tender (Vermont: Chelsea Green Publishing, 2001), chapter 12. Thomas H. Greco, Jr., The End of Money and the Future of Civilization (Vermont: Chelsea Green Publishing, 2009), chapter 12.